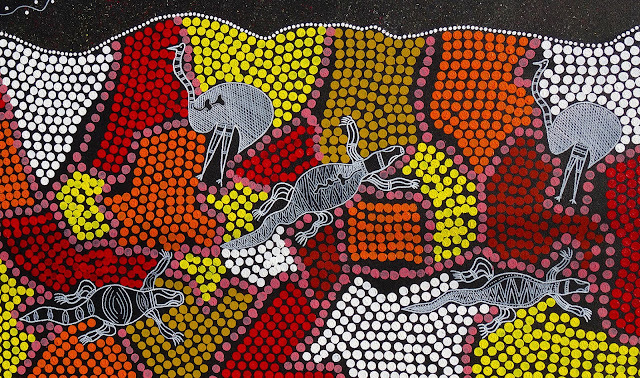 This Australian Aboriginal art mural (detail below) adorns a renovated old "corner shop" that has been converted into a residence. The bricked up plate glass windows on front and side have been recently painted with this mural, the artist being Yamba Konrad Ross (contactable at sunsetdreaming@hotmail.com). The mural is very eye-catching and forms a focal point for the otherwise mundane suburban street in which it is found. and also part of the ABC Wednesday meme. Like Anita already wrote… very eyecatching and colorful . Wonderful to see you participate in this new round again. I am looking forward to your upcoming entries! Thank you for participating.